I think Detroit is a real good fit because historically they are a puck possession team. They have always had Russians come in and play very well […] and they handle their veterans very well. Sergei Gonchar was not a name that I had previously considered, however I do agree the Russian blueliner would make a nice addition to Detroit’s rather green backend. He might have lost a step or two over the years, but he would make an immediate impact on a Wings team searching for a top four defender. In fact, with 18 points Gonchar would be the second highest scoring d-man on the Wings behind only Niklas Kronwall. 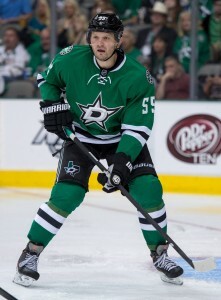 As well, he is still very durable having dressed for 49 of the Stars’ 55 games this season. For those of you keeping score at home Gonchar has played more games than his much younger and more injury prone counterparts such as: Jonathan Ericsson (36 games) and Danny DeKeyser (40 games). I can already hear the naysayers screaming the last thing the Wings need is a 39-year-old veteran defender. Well, I couldn’t disagree more because one aspect missing from Detroit’s lineup is an experienced backend. Currently Niklas Kronwall is the only Red Wing defender above the age of 30. And, it never hurts having a seasoned NHL defenseman who has been there and done that all before. Gonchar has played in 135 NHL playoff games, reached the Stanley Cup Finals three times, tallied 90 career playoff points, and has lifted the Stanley Cup one time. Gonchar’s presence would unquestionably stabilize Detroit’s young defense. Plus, he’d sure look nice teamed with Danny DeKeyser on the Wings’ second d-pairing. The Wings might have the inside track on a deal for Gonchar because of Ken Holland‘s relationship with the Dallas GM. Jim Nill worked under Holland for 15 seasons in Detroit and the two remain close friends. If Nill is indeed considering moving the veteran then it’s probably a safe bet that his old buddy Ken Holland‘s phone might be the first to ring. Nill also has an in depth knowledge of the Red Wings’ player personnel so he would know exactly what he’s looking for in return. Money might be the biggest hurdle in making this transaction a reality. Gonchar has another year remaining on a contract that earns him $5 million per season. However, if the Stars can eat part of the contract as Sportsnet’s Brian Lawton suggests then a deal could definitely be struck. In spite of his age Gonchar is still an effective top four puck moving defender the Wings are searching for. The benefits of adding number fifty-five to Detroit’s backend far outweigh the costs… and with buddies Nill and Holland at the controls this deal just might get done.